Camp Naco is the only remaining military compound of 12 established along the U.S. Mexican border during the Mexican revolution of 1910 to 1920. 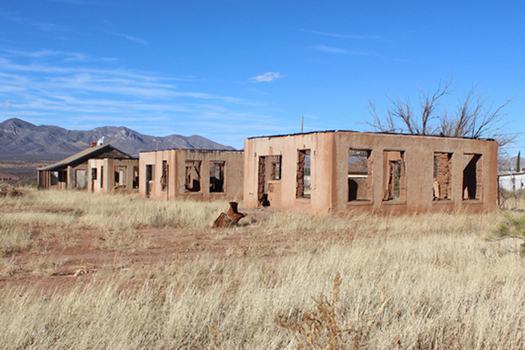 It is located in the town of Naco about 13 miles south of Bisbee in southeastern Arizona. Today, there is a perimeter fence around the old camp and there is no access to any of the buildings, but it is still a very interesting place to visit. A Facebook Page "Friends of Camp Naco" has photographs of the interior portions of the camp, reports of restoration work and announcements of upcoming tours. 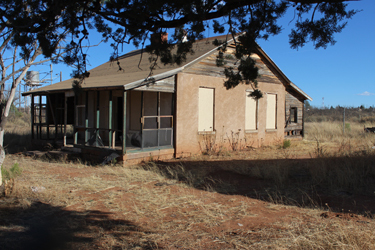 The property is owned by the town of Huachuca City. I first became aware of the old fort while doing a Google Earth flyover along the road bed of the El Paso & Southwestern Railroad. An online report on the History of Camp Naco states that there was a military presence in Naco from 1911 to 1923. It is thought that the current buildings were constructed sometime between 1919 and 1923 as part of the War Department's Border Defense Project. "The project was to protect the soldiers against the elements and to protect U.S. citizens and economic interests". This fort was the only one constructed of adobe. The troop strength varied from 50 to 5000 soldiers. At different times, the camp was home to the 9th, 10th Calvary Regiments and the 25th Infantry Regiment, all Buffalo Soldier units. The camp was closed in 1923. In the 1930's it was used as a Civilian Conservation Corps camp. 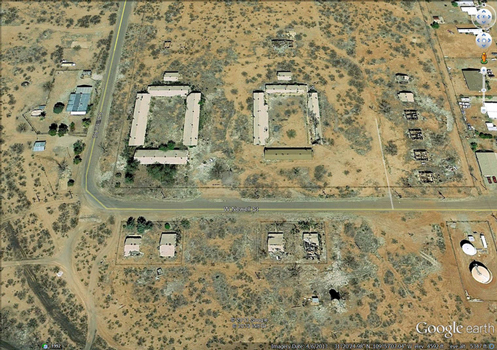 There are 4 buildings on the south side of the camp that appear to have been officers' quarters. One of those buildings has been restored. Along the east side of the camp there is a set of four buildings that are alike in their construction. These may have been the quarters for NCO soldiers. The unit at the far north end of the line looks to have been restored. The enlisted mens' barracks were arranged in two quads. From a distance, the majority of those buildings look to be under restoration. At least one of the buildings, however, appears to have been reduced to walls. Each of the buildings at the fort appears to have been equipped with a certain amount of heating and cooling. There were distinctive "ventilators" mounted on the roofs that rotated in the wind to catch the prevailing breezes. The "Friends" facebook page identifies these structures as "Swartout Ventilators". On the day that I visited, several of those ventilators were turning!